It was the poignant moment Josh Daniels bravely came off the bench to a standing ovation before netting his debut goal for Derry City against Finn Harps in front of the tv cameras and a full house at Brandywell Stadium on May, 2016, less than two months after tragedy struck his family. And as the first anniversary of that tragic accident, when five members of his family, including his mother, Ruth and sister, Jodie, died when their car plunged off Buncrana Pier approaches, Josh is prepared for his biggest season since making his Derry City breakthrough five years ago. Speaking publicly for the first time about the devastation and the immeasurable grief he has suffered, he says his heartache has become the driving force behind every performance when he pulls on the jersey to represent his hometown club. The talented midfielder remains indebted to his Derry City family for his brave and inspirational comeback just two weeks after his heartbreaking loss, and as he netted his first Derry goal with his first touch on a night which stirred the emotions at the Lone Moor Road venue where his mum and sister used to cheer him on from the front of the now demolished Glentoran Stand. Josh, who turned 21 years-old last week, believes the timing of that goal was significant in terms of getting his career and his life back on track. He has kept the boots and jersey he wore that night tucked away safely as a memento of a match that he will never forget. “I remember there was a massive crowd in the Brandywell,” he recalled. “I wasn’t in the starting team but I remember being entirely focused on the game. It was a massive game for us as it was a chance to avenge the loss in the first game of the season and it was on TV in front of thousands of fans. I was sitting on the bench and Kenny (Shiels) said, ‘get ready Josh’ and it just felt right. I came on and got a massive reception and then it all started. “I remember carrying on with Ronan (Curtis) before the match and warned him he better score or else I would come on and score. I remember thinking, this would be a nice time to do it and, thankfully, it all went according to plan. “It was like a blur at the time, but when I came on, got the ball, beat the right back who brought me down for a free-kick. I thought ‘I’ve got the better of him already, happy days, off to a good start’. Then the ball came into the back post and I put it in the net - I got my first goal and it was the best feeling ever! “It was the most emotional time. It was playing in front of my family, the fans, everybody in the city. It was a significant time for me. I went on to get an assist for (Rory) Patterson’s goal as well. It was a massive game for me and I’ll always remember it - my first goal. Brilliant! Josh pictured with his late mum, Ruth, who he described as his biggest supporter. “The timing of that goal was very significant in my life,” he continued. “There were Harps’ fans cheering and that summarised football for me. Two bitter rivals, but the fans pull together in tragic situations - that’s amazing, The sound that night was class. It would have been nicer if we got the 2-1 win but it was still a special night for me. Despite concerns from his family and friends that he was returning to football too soon, he felt his mum would have wanted him to get straight back into it. He wanted to get back sooner but praised Kenny Shiels for protecting him and easing him back into the set-up. I did what I felt was right. I also knew what they would have felt was right for me to do. They would have wanted me to do this. They were my biggest supporters, 100 per cent. He’s played under four different managers during his time at Derry City, but Shiels played an integral role when his life was turned upside down on March 20th 2016. Josh displayed no shortage of dignity and courage during that traumatic time but one of the points he wanted to get across in this particular interview was that he doesn’t want sympathy. He wants to earn his place in the first team as a result of his performances. 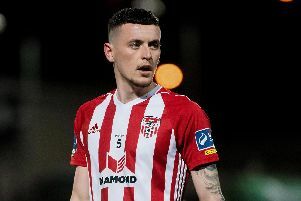 He’s been overwhelmed by the support from the local community, Derry City fans, staff and players but he now hopes to focus on what is a hugely important year in terms of his career progression this season. “It was tough. I came back about two weeks after and to be honest I wasn’t looking to stay out any longer. I was trying to get back a couple of days, maybe a week afterwards. It was just second nature, I had to go back and play. “It gave me motivation more than anything. I had a game before the Harps match, against Sligo Rovers in the cup. But I got an injury as soon as I got back because I was going at it 100 miles per hour straight away when I wasn’t ready. Josh insists he’s always been motivated to do well in the sport. It’s always been his dream to play in the top leagues in England but the tragedy has helped him learn to keep things in context and focus on his personal goals. “I think people are different; other people will probably have dealt with it differently to me. Before it happened I was always motivated to do well. I always wanted to be a footballer and you couldn’t take the football away from me when I was a boy. “Obviously it’s been a massive loss, it’s been traumatic but I’m a footballer and I want to play football and they would have wanted me to get back playing. So I tried to get back in the team as soon as I could. “I didn’t want to be in the team for sympathetic reasons. I was fighting for my place and I still am. I need to try and kick on this year. I’m 21 now and this is my fifth season with Derry. I want to cement my place in the squad. A massive part of football and being young is learning how to deal with all the things that come your way. His Derry City family has been his support this past year and having battled through adversity he knows life must go on. ‘Time doesn’t stop for anybody’, as he puts it. And with his family never far from his thoughts and always in his heart when he dons that Candy Stripes shirt, the likeable Galliagh lad is driven towards personal and team success in 2017. Let’s hope he can achieve his goal and fulfil his undoubted potential.